We all want to see our followers on social media skyrocket in numbers. But numbers don’t necessarily equate to engagement, return on investment and…sales! Don’t fall into the social media trap of being obsessed with getting over 100K followers, especially if you are a small business. A “friend” that can be trusted. Tip: Never buy followers, however tempting this may be! You will get a ton of followers from distant countries that don’t care about your business and will never like, comment or share any of your updates! On Facebook, your engagement score will drop and will take time to reverse the damage. On Twitter and other social media channels, these “bought” followers will not give your business any added value or boost. Post relevant, entertaining and meaningful content (include photos, images and video) two to five times each day and get involved in the conversations. The goal is to kindle actions in the form of likes, comments and shares. These three actions create stories on Facebook, Twitter and other channels, and create opportunities for your posts to get greater reach. A greater reach means you increase your chances of organically attracting new quality followers. Be genuine, be human, be yourself. It’s easier to turn a follower into a buying customer when they truly trust and like you. Would I engage with that post if I saw it in my news feed? Did I ask for or encourage action (like, share, comment)? If there’s a photo, would you want to share it if you saw it in your News Feed? Does this post truly add value to my audience? Does this post educate, entertain or empower? Their success is achieving the RIGHT KIND OF FANS. This is why social media marketing cannot be matched by other mediums like PPC, SEO and online advertising. It produces incredible short and long term value for businesses. It isn’t just child’s play — it’s big business! Make it big business for your business. It’s not about increasing the follower counter with huge numbers that will not impact your business. 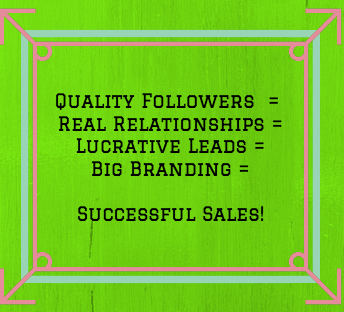 Be sure to attract quality followers and build relationships.